Rocky Hill, CT (November 8, 2017) – The Connecticut Green Bank announces that Metal Finishing Technologies (MFT) of Bristol is using financing from the Commercial Property Assessed Clean Energy (C-PACE) program to implement energy conservation measures (ECM) that are projected to save the manufacturer nearly $2 million in energy costs over the effective useful life of the ECMs. MFT, which operates out of a 70,000 square foot facility, is a nationally recognized source of diversified metal finishing and surface preparation as well as a certified Federal Aviation Administration repair station servicing the automotive, marine, aerospace, medical, commercial and electrical industries since 1947. MFT is working with contractor Design with Nature to complete the project. MFT President / CEO & Owner Pete Mirabello said, “working with Mitch Kennedy and the folks at Design with Nature took a somewhat complex and multi-faceted project and made it an easy to understand and more importantly lead to a highly effective result. I would recommend Mitch and is team to anyone looking to upgrade any part of their energy platform.” The project at MFT will include the installation of high efficiency transformers, HVAC air handling units, compressors, interior LED lighting, and windows. In total, the project will cost over $650,000, with the C-PACE loan covering more than half and the remainder provided through one-time utility incentives and grants. The cumulative net cash flow for MFT is projected at nearly $1.5 million. Metal Finishing Technologies, LLC. (www.mftech.com), MFT is one of the largest, oldest and most diversified metal finishers in New England. Since its founding in 1947, MFT has serviced plating and turbine component coating and removal clients throughout the Northeast and across the US. MFT has been under new ownership since 2011 when Peter Mirabello bought the Company. The company operates out of a 72,000 square foot ISO 9000-2008 / AS9100 governed facility, designed specifically to meet the stringent handling and environmental needs of the metal finishing industry. (Oct. 3, 2017 – Waterbury, CT) – For Waterbury property owner Michael Batista, the success of the Connecticut Green Bank’s Commercial Property Assessed Clean Energy (C-PACE) program is worth repeating. For the second time in two years he has accessed C-PACE funding to improve energy efficiency at one of his mixed-use properties in the state’s fifth largest city. 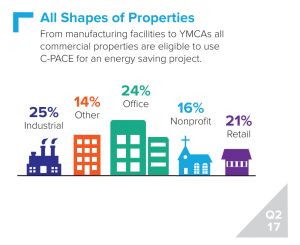 Batista’s two C-PACE financed projects show that the program, which is often used to help manufacturers and larger commercial properties, can benefit a wide range of properties and their owners, who are seeking ways to improve energy efficiency, save money on energy costs, and reduce environmental impacts. Both projects were completed by M.J. Fahy & Sons Inc., a plumbing and heating contractor located in Waterbury. Most recently, Batista used the C-PACE program to finance the energy improvements at his property at 1023 West Main St. in Waterbury. The property was converted from one that relied on an outdated oil burner to a system featuring seven individual gas fueled furnaces that more efficiently services four residential units and two commercial units. Over the duration of his 12-year loan, it is estimated the new system will save Batista and his tenants as much as $84,000 in energy costs. C-PACE is an innovative program, administered by the Green Bank, that is helping commercial and industrial property owners access affordable, long-term financing for meaningful energy upgrades to their buildings. By enabling building owners to finance qualifying energy efficiency and clean energy improvements through a voluntary assessment on their property tax bill, comprehensive energy improvements – that would otherwise be difficult to afford – are made possible. Batista previously used C-PACE financing to pay for an oil-to-gas burner conversion at a second mixed-use property in Waterbury. In that case, he expects to reduce fuel costs by $56,000 over the next 15 years. To learn more about C-PACE, please visit CPACE.com. Rocky Hill, CT and New York, NY (Sept. 12) – The Connecticut Green Bank and Onyx Renewable Partners L.P. (“Onyx”) are excited to announce the Green Bank Solar PPA (power purchase agreement), a joint program that will provide funding for 15-20+ megawatts of commercial-scale solar projects in Connecticut. Onyx is a Blackstone portfolio company specializing in renewable energy development and finance. Onyx is focused on greenfield development and M&A opportunities in the North American solar and wind sectors. Onyx is also continuously evaluating the market to partner with experienced teams to pursue opportunities employing other renewable power technologies. For more information about Onyx, please visit www.onyxrenewables.com. (September 8, 2017) – The Connecticut State Colleges & Universities (CSCU) has partnered with Current powered by GE, SunLight Solar Energy and CT Green Bank to install solar energy systems at three campuses in order to reduce energy consumption and decrease operating expenses. Construction is scheduled to begin at Manchester and Middlesex Community Colleges as well as Southern CT State University in late fall with the goal of extending to other campuses including Central, Housatonic, Asnuntuck, Quinebaug, Tunxis and Western in the next two years. The solar energy initiative is funded entirely with private capital sourced by Connecticut Green Bank and once fully implemented is estimated to save CSCU more than $10 million within the first 20 years. GE (NYSE: GE) is the world’s Digital Industrial Company, transforming industry with software-defined machines and solutions that are connected, responsive and predictive. GE is organized around a global exchange of knowledge, the “GE Store,” through which each business shares and accesses the same technology, markets, structure and intellect. Each invention further fuels innovation and application across our industrial sectors. With people, services, technology and scale, GE delivers better outcomes for customers by speaking the language of industry. www.ge.com. Groton, CT (August 14, 2017) – Using the Connecticut Green Bank’s innovative Commercial Property Assessed Clean Energy (C-PACE) program, CURE Innovation Commons (“The Commons”) has financed energy improvements that will save the laboratory incubator more than $1.7 million in energy costs over the 17-year life of the loan term. The project at The Commons is a perfect example of how support from Connecticut Green Bank can advance green energy goals and expand our economy by investing in the jobs and technologies of the future. The Commons is one of Connecticut’s newest science and technology incubators for entrepreneurs, professionals, scientists, start-ups and growing companies to develop ideas and build businesses in a collaborative community setting. 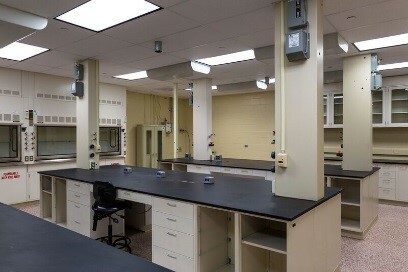 In addition to funds provided for renovations by the Connecticut Department of Economic and Community Development (DECD), The Commons used C-PACE to fund energy efficiency upgrades including the installation of new HVAC equipment and a high efficiency generator. Since its creation in 2011, the Connecticut Green Bank has deployed more than $1 billion in capital to fund green energy projects in Connecticut. This investment helps Connecticut create jobs, meet carbon reduction goals and improve the state’s energy security. Middletown, CT (August 1, 2017) – Ferazzoli Imports of New England, Inc., which conducts business as Galleria Stone, an importer, distributor and fabricator of tile and natural stone, is the most recent business to reduce their energy burden by installing a renewable energy source on their building through Connecticut Green Bank’s Commercial Property Assessed Clean Energy (C-PACE), an innovative program that helps property owners access affordable, long-term financing for smart energy upgrades to their buildings. Northeast Smart Energy LLC of Hartford will install a 125 kW solar photovoltaic (PV) system to the roof of the Galleria Design Center, located at 234 Middle Street in Middletown. The estimated annual energy cost savings exceeds $37,000. Through C-PACE, a building owner can pay for green energy improvements over terms up to 25 years through a voluntary benefit assessment on their property tax bill. Building owners can secure long-term, low-interest capital to fund these energy improvements, with no up-front costs required. The program is structured so that the energy savings offset the benefit assessment – meaning positive cash flow for the business – and includes a technical review process that leaves building owners feeling confident in the predicted energy savings of their project. This project is part of Connecticut Green Bank’s Energy on the Line program, funded through the Connecticut Department of Economic and Community Development’s Manufacturing Innovation Fund. Energy on the Line provides supplemental funds to eligible manufacturers who complete a qualifying green energy project using the C-PACE program. For more information on Galleria Stone, please visit www.galleriastone.com, and for more information the Connecticut Green Bank, please visit www.ctgreenbank.com. Ferazzoli Imports of New England Inc., now doing business as Galleria Stone, was incorporated in 1988 as an importer, distributor and fabricator of tile and natural stone. Originally located in North Haven, Connecticut, Galleria Stone relocated its corporate headquarters in June 2002 to the 100,000 square foot Galleria Design Center in Middletown, CT. The Galleria Design Center includes an expansive 30,000 square foot showroom, indoor natural stone gallery and a state-of-the-art fabrication plant that helps Galleria Stone continue the tradition of elegance, craftsmanship and efficiency for which it is best known. Northeast Smart Energy was established in May of 2007 by its founders whose vision is rooted in their love for our planet. Northeast Smart Energy’s primary focus is to provide people with renewable and cost effective energy solutions that reduce our dependence on polluting sources of energy. Northeast Smart Energy is ready to help you do your part by reducing your environmental impact and leaving our planet in a condition of which our children would be proud. 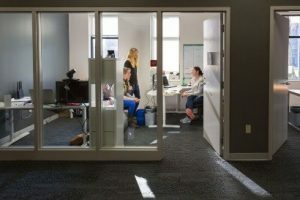 The cost of doing business can be expensive, and many Connecticut business owners might not feel that they have control over factors that result in rising costs. Building owners know that making energy improvements is one way to reduce operating expenses, but they may not understand how to get started. They might consider energy-efficiency upgrades or explore renewables, such as solar photovoltaic (PV) systems, but financial questions can slow or derail their investigations. Instead of moving forward, they end up with deferred maintenance and aging equipment in uncomfortable, inefficient buildings. But what if there was a way that building owners could make energy upgrades that improved their bottom lines, resulted in positive cash flow and a competitive edge, and made their buildings more comfortable? In Connecticut, where energy costs are high, it is possible to improve a building’s energy use and efficiency and create measurable savings. This “found” money can be re-invested into the business, strengthening a company’s ability to focus on its core mission and to thrive in the future. Building owners who make these upgrades also have more comfortable buildings for their employees, tenants or customers, and contribute to a healthier community and economy in Connecticut. Finding the right way to pay for energy upgrades, however, requires balancing business priorities. There are bank loans and lines of credit, but these can have short repayment terms or high interest. A business owner might not have the desire, or ability, to take on this type of debt. Cash payment could be an option, though this method will immediately divert funds from a business’s primary competency, and it might take time to recover the cash outlay. Paying for energy improvements in these ways means building owners give up control of their cash flow, tying up resources and distracting them from what they need to focus their attention on most. An innovative program called Commercial Property Assessed Clean Energy (C-PACE) offers a better option. Through C-PACE, a building owner can pay for green energy improvements over terms as long as 25 years through a voluntary benefit assessment on their property tax bill. Building owners can secure long-term, low-interest capital to fund these energy improvements or renewables with no up-front costs. Best of all, the program is structured so that the energy savings offset the benefit assessment – meaning positive cash flow for the business – and includes a technical review process that leaves building owners feeling confident in the predicted energy savings of their project. This allows them to invest the savings into equipment, personnel, materials or whatever they need to achieve their goals. Deferred maintenance is no longer necessary, and renewables such as solar PV are in reach for building owners of all types, including nonprofits, manufacturers, commercial real estate, retail, and others. For many businesses, especially those in energy-intensive sectors such as manufacturing, adding a renewable energy source can save money and enhance performance. This was the reason Paul Breglio, president of Crest Mechanical in Hartford, decided to go solar. At first, Breglio was stalled by the initial cost of the project, until he found C-PACE. 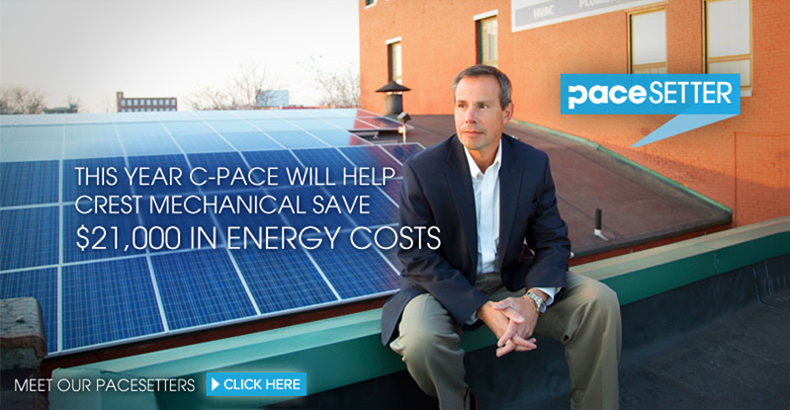 Through C-PACE, he was able to install a 55 kW roof-mounted solar PV system, which offers projected energy savings of more than $400,000 over the life of the upgrade. For Crest Mechanical, which provides services including the construction and maintenance of mechanical systems, such as HVAC and cogeneration, to commercial, industrial and institutional customers, this savings is significant. Galleria Design Center, an importer, distributor and fabricator of tile and natural stone, whose building is easily seen from I-91 in Middletown, is using C-PACE financing to add a 125 kW solar PV system. 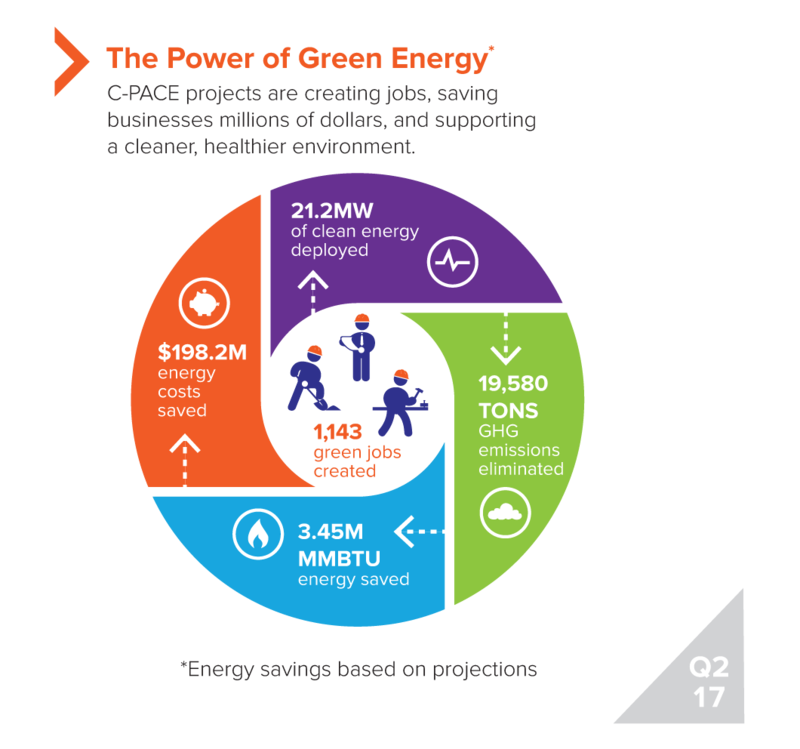 The estimated annual energy cost savings exceeds $37,000. While C-PACE is not only for those in the manufacturing sector, manufacturing facility owners recently benefited from a program called Energy On The Line, a partnership between the Connecticut Green Bank, the Manufacturing Innovation Fund, and the state Department of Economic and Community Development. The program provided up to $50,000 in grant money for project-related expenses at manufacturing facilities. More than 160 building owners across the state have benefited from solar PV and energy-efficiency projects financed using C-PACE, and more than $100 million in closed project financing has been made available. 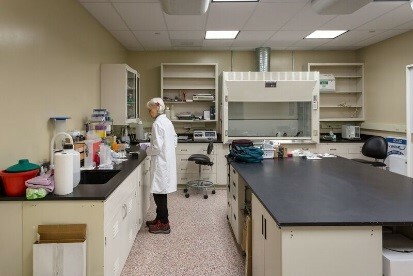 For more information, visit ctgreenbank.com/business. Rocky Hill, CT (July 24, 2017) – The Connecticut Green Bank announced its C-PACE (Commercial Property Assessed Clean Energy) program has reached the milestone of $100 million in total closed project financing. The solar photovoltaic (PV) and energy efficiency projects, which vary in size and scope, are saving more than $9.29 million annually in energy costs for nearly 170 building owners across multiple sectors. The Green Bank, which administers the C-PACE program, seeks to make green energy more accessible and affordable to commercial and industrial property owners by providing no money down long-term financing for meaningful energy upgrades to their buildings. C-PACE enables building owners to finance qualifying energy efficiency and renewable energy improvements through a voluntary assessment on their property tax bill. As the program grows, more Connecticut businesses can achieve lower energy costs. Reaching $100 million in closed project financing positions Connecticut’s program as a national leader. According to market data from PACENation, an industry group promoting Property Assessed Clean Energy, California is the only state to have closed a larger total sum of project financing for commercial PACE projects. Since its inception in 2011, 166 C-PACE projects have been closed in 69 of the 128 municipalities that have opted-into the program. C-PACE funds have been used in manufacturing facilities, non-profits, houses of worship, retail establishments, office buildings, and other business entities. The projects consist of solar installations, new boilers, energy efficiency lighting measures, HVAC systems, and other energy improvements that help building owners to take control of their energy costs. 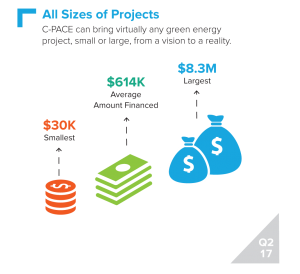 Connecticut’s C-PACE program maintains an open market approach, allowing private capital providers to finance projects for building owners, and, in 2015, the Green Bank reached an agreement that provided it access to up to $100 million in private funding for C-PACE projects. Today, nearly 70% of the funding in the program consists of private capital. This milestone was achieved through the efforts of many key stakeholders. 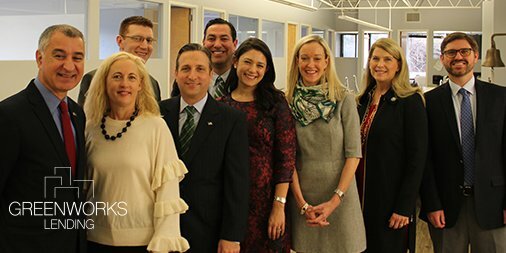 The Connecticut Green Bank’s success, and that of the C-PACE program, has led to the Green Bank being used as a model for other states.